On November 29th, 2012, Enbridge Inc. filed their application to the National Energy Board. I have summarized the proposal below. For the full document and all attachments, please click here. Line 9 runs between Sarnia and Montreal. It is currently flowing in an East to West direction. The Line 9A reversal (West to East) has already been approved. The Line 9B reversal is currently before the National Energy Board. Included in the Line 9B reversal is a capacity expansion for the entire Line 9 from 240,000 barrels per day (bpd) to 300,000bpd. NOTE: Throughput on Line 9 over the last three years (2009-2011) has averaged only 64,000bpd. If this project is approved, Enbridge will be shipping heavy crude from the Alberta Oil Sands and fracked shale oil from the Bakken Formation (North Dakota) toward refineries in Quebec. Once the oil reaches the Montreal Terminal, it will either be processed at the Suncor refinery, loaded on to barges and transported up the St. Lawrence River to the Valero refinery outside Quebec City, or shipped to overseas markets. Line 9 is an existing Enbridge pipeline which was built in 1976. It is 30 inches in diameter and wrapped in a single layer of polyethylene tape. The reversal of the flow will be achieved mainly by modifying existing Enbridge facilities. The increased capacity will be achieved through the addition of pumps and skids that will inject Drag Reducing Agent (“DRA”) into Line 9. DRA will be injected at the Sarnia Terminal, North Westover Station, Hilton Station and Cardinal Station. Concern: Enbridge has not released a full list of all chemical components of DRA or the impact of this product on humans, animals, or the environment in the event of a spill. During the Enbridge Line 7 Capacity Expansion Project – which quietly happened in summer 2013 – Enbridge filed an MSDS of DRA which cited “non-hazardous materials” as the chemical name. Enbridge professes that the purpose of the Line 9 project is to respond to requests from eastern Canadian refineries to have access to the growing and less expensive supplies of crude oil production from western Canada and the US Bakken region. Concern: There is no guarantee that all of the oil shipped will be for Canadian refineries. TransCanada’s Energy East also lists the Suncor and Valero refineries as recipients of oil. The two refineries combined can only process 400,000bpd. Either these refineries are planning a massive upgrade, or most of the oil is going through our communities destined for international markets. Additionally, given that this project was not subject to an environmental assessment, Enbridge was not required to submit an Environmental and Socio-economic Assessment (“ESA”), which would have included “alternatives to” the project and “alternative means”. These are two very important components which help to justify the rationale of a project. Without an ESA and complete picture of possible alternatives, we cannot be certain that the proposed project is the best option. Subject to the receipt of regulatory approvals, the construction of the project is scheduled to commence in Q4 2013. Construction for the project is expected to be completed by the end of Q2 2014. Concern: Enbridge is moving quickly and quietly. The NEB hearing was limited to one week and the NEB is currently making a decision within a much shorter time frame than previous projects. Due to regulatory delays, the NEB decision has been pushed to Q1 2014 (likely by February). Directly affected landowners, tenants and residents along the existing pipeline ROW. Communities and municipalities along or near the existing pipeline corridor and facilities. Concern: As I traveled through communities along Line 9, I spoke with numerous residents whose property backed right on to the Line 9 Right of Way (ROW). They were not consulted about the proposed changes. Many of them didn’t even know the oil pipeline was there! 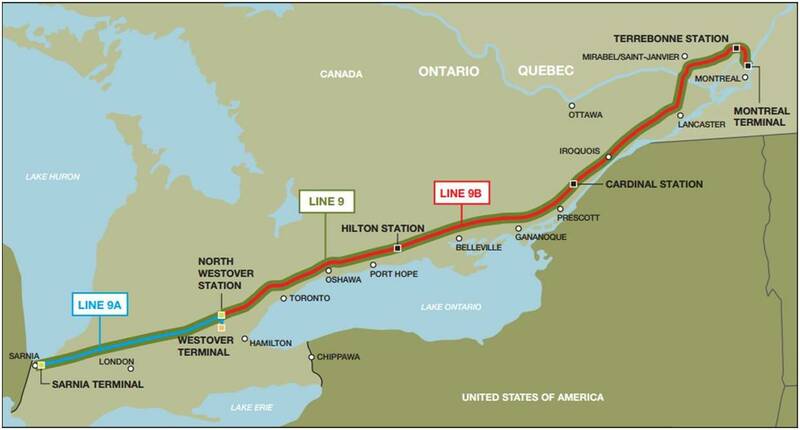 Enbridge Line 9 shares the ROW with TransCanada’s gas line. Many residents were shocked and angered to learn there was a second pipeline that they knew nothing about. naware about. The Line 9 project falls under the jurisdiction of the NEB Onshore Pipeline Regulations, 1999 (“OPR-99”), which incorporate by reference the CSA Z662-11 Oil Gas and Pipeline Systems standard. The typical properties of the oil to be transported in Line 9B are shown below. The existing Maximum Operating Pressure (“MOP”) of the pipeline will not change post reversal. DRA units will be required at the Sarnia Terminal, North Westover Station, Hilton Station and Cardinal Station. Concern: Heavy Crude is significantly more viscous than light or medium crude and will therefore require the injection of a “Drag Reducing Agent” to flow along Line 9. Although repeatedly asked, Enbridge has not disclosed the full list of chemical components in this DRA. Additionally heavy crude is more dense than light crude, which adds more weight per barrel to the aging pipeline. Further, just because the MOP will not increase, does not mean the pipeline is proven safe at that MOP. Many pipelines are approved for a fairly high MOP, but consistently operate well below that threshold. The Line 9 project is expected to move a variety of crude oils sourced from western Canada (Oil Sands) and the US Bakken region (hydraulically fractured oil shale). Given the refinery configurations in the Quebec market, this supply will be composed of primarily light crude, although some heavy crude oil is expected to be transported. It is expected that the reversed Line 9B will be used to serve the two refineries located in the province of Quebec. These refineries, operated by Suncor Energy Products Partnership Inc. and Ultramar Ltd., have current capacity to refine 135,000 and 265,000 bpd respectively. This represents 133% of the capacity of the proposed project. 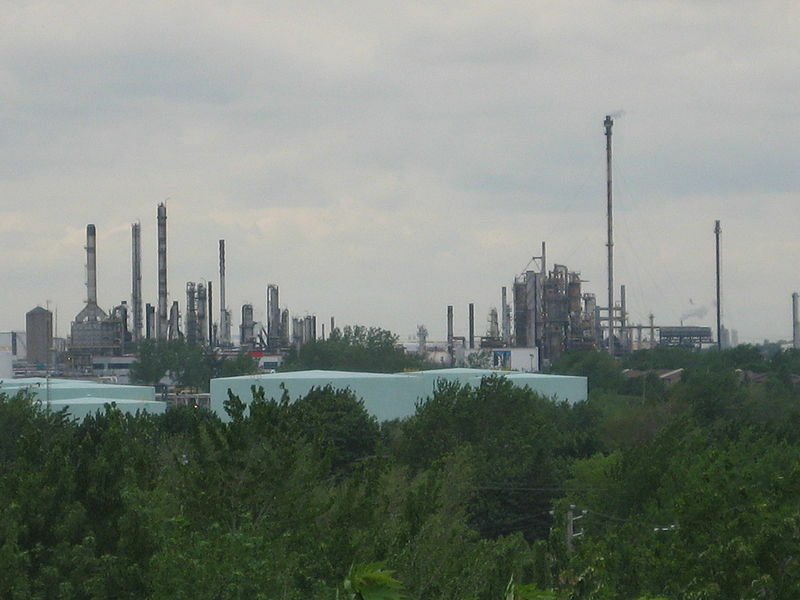 Concern: The Quebec refineries currently have the ability to refine 5-10% heavy crude oil. However, if these refineries are updated, Enbridge has admitted that up to 100% of the oil creeping through Line 9 could be sourced from the Alberta Oil Sands. This would mean that 100% of the oil would require injection of DRA. Additionally, refining heavy crude in highly populated areas such as Montreal and Quebec City would raise a whole new set of environmental and health concerns. From a Canadian politics perspective, we are seeing more and more pipelines race to the coasts. We do not have the refining capacity for the millions of barrels of oilsands extracted every day and are therefore shipping raw products across the oceans to international markets. The average person sees very little economic gain from this system, while the oil companies make unimaginable profits by transporting dangerous goods through our back yards. Enbridge states that a comprehensive emergency plan is in place for all of its pipelines. This plan included many preventive measures, such as advance education of the public regarding pipeline crossings and encroachment issues. Enbridge states that they also communicate regularly with stakeholders along its pipeline corridors, including landowners, government agencies and emergency response officials (such as police and health care providers). Enbridge says that their pipelines are marked at regular intervals with emergency contact information. Concern: From first hand experience, I disagree with these claims. There was no evidence of Enbridge providing residents along the ROW with an emergency management plan. During the NEB hearing, it also became very apparent that not all emergency responders had received training. Rather than face to face, Enbridge had rolled out a project of oil spill response training by USB stick. Multiple fire departments and police stations never received it. 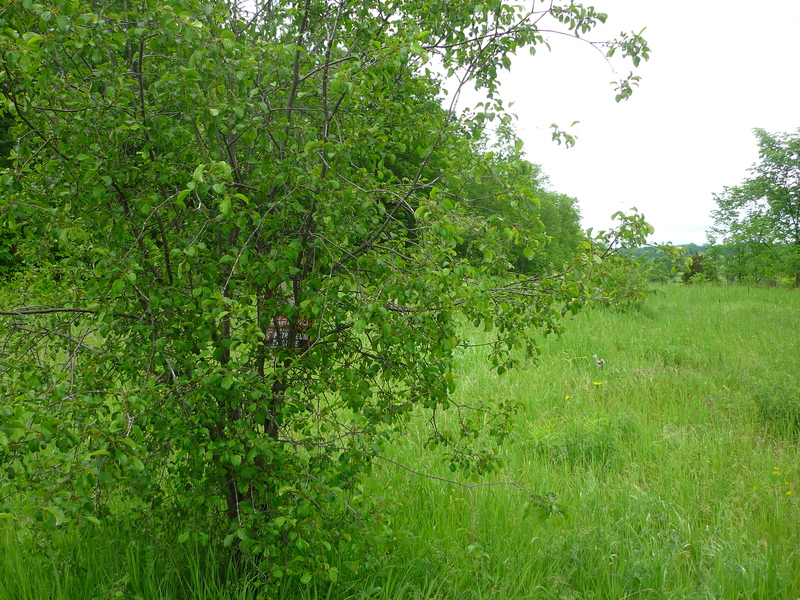 Photo of Enbridge ROW where the only sign notifying residents has been overgrown by a tree. Since bringing this matter to Enbridge’s attention, they have re-signed the crossing, but with signs that are already failing and falling over in the moist soil. The sign in the tree remains. thanks for this information. Is this group active? Are you insisting on hydrostatic tests before activation? Do you know activation is planned for June, once new tarifs are approved by NEB to cover the 400M$ cost over-run?